Another Lace that I love! 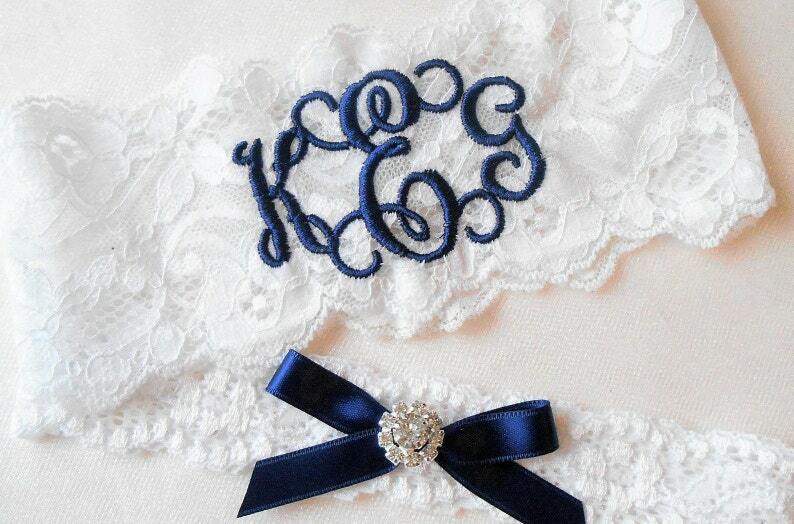 "Beautiful" this Monogrammed Keepsake Bridal Garter offered in a single or set. Select in the drop down single keepsake or the set includes a toss. This listing is for the 3" WHITE OR IVORY floral stretch lace Monogrammed. I have many colors of thread I will except a request. I may send an ivory or white bow. The thread color in the photos, navy,and Turquoise. I have many colors. WHAT I NEED FROM YOU AT CHECKOUT! Please notice the white and ivory toss are not the same lace. PERFECT EXAMPLE OF WHAT I NEED. THE DATE NEEDED: 5/31/2016 Thread Color: Navy. Please list in the order that it will appear on the garter. Use a soft measuring tape, do not pull tight or take inches off please. No measuring tape wrap a string around your leg and measure it. Please click the link below and read my welcome page for current processing times. Business days do not include weekend days. Thank you for stopping at my shop! 2" LACE OPTION CLICK LISTING BELOW. This was so easy to do and it turned out so cute! My garter set is absolutely perfect!! I can't wait to be able to wear it on my wedding day! Was an amazing fit!!! Came in just in time for the wedding!!! Beautiful!!! I’m so excited for my wedding now!! No refunds or exchanges, sorry. All Items are handmade when ordered and are considered custom made. I ship with delivery confirmation, 1rst class mail. If you would like priority mail please contact me. If you would like insurance add $1.80 please. Sorry not responsible for lost shipments.